Morocco and Nigeria signed Sunday in Rabat cooperation agreements related to the pipeline project, a fertilizer plant in Nigeria and agricultural vocational training. The signing ceremony of the three agreements was co-chaired by King Mohammed VI and visiting President Muhammadu Buhari. The two countries agreed to the pipeline in December 2016 and launched feasibility studies leading to a plan to build the pipeline onshore and offshore in phases. As the 5,660 KM-long pipeline, to pump gas from Nigeria up to Morocco, will cross several African countries, Morocco and Nigeria will launch a front-end engineering design (Feed) to involve countries that will be crossed by the pipeline in the Economic Community of West African States (ECOWAS). This phase includes assessment of the financial cost of this project, which will enhance regional economic integration, help West African countries meet their energy needs and supply Europe with Nigerian gas. Nigeria, Africa’s biggest oil exporter, has huge untapped gas resources, while Morocco has the world’s largest phosphate reserves. During the ceremony, Morocco’s State-owned company, OCP, signed an agreement with Nigeria’s Sovereign Investment Authority to build an industrial platform for the production of ammonia and derivatives. Under another agreement also signed Sunday, Morocco will offer Nigerians agricultural professional training and technical supervision. 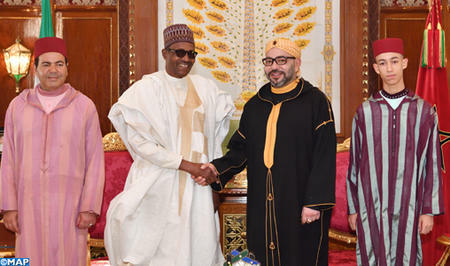 While in Morocco, President Buhari had private talks with King Mohammed VI who hosted an Iftar (breaking Ramadan fast) in honor of his African guest. The Nigerian President also visited the Mohammed VI Institute for the Training of Imams, Murshideen and Murshidat (male and female preachers). Set up in 2015, the Institute provides training to hundreds of students from Morocco, sub-Saharan Africa, and some European countries. This leading center seeks to inculcate in Imams the precepts of a tolerant and non-violent form of Islam based on Maliki rite and teach them how to fight extremism and religious radicalization through sound argumentation and dialog. Morocco has been providing, for many years if not for centuries, training to foreign Islamic scholars and imams, mainly from sub-Saharan Africa, in order to disseminate an “Islam of the middle path doctrine,” a vision of religion based on tolerance, intercultural dialogue and respect of other faiths. Written by: Jaber Ali on June 11, 2018. Posted by Jaber Ali on Jun 11 2018. Filed under Energy, Headlines, World News. You can follow any responses to this entry through the RSS 2.0. Both comments and pings are currently closed.